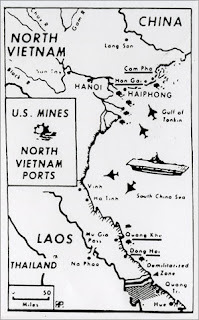 .... 1972 (40 years ago today), as a response "a massive invasion of South Vietnam" mounted by the North Vietnamese about 5 weeks earlier, U.S. President Richard M. Nixon announced that he'd ordered principal ports in North Vietnam to be mined, and that the mines would be activated in 3 days. 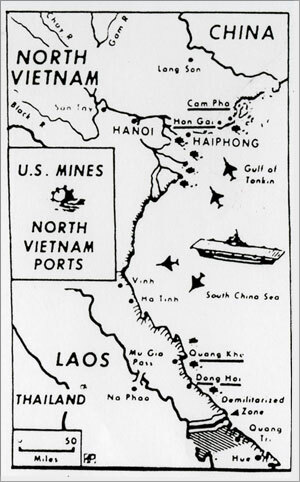 (image credit) Other measures, such as U.S. Navy searches and bombing of railways, also were threatened. His goal, as stated in his televised speech on this day, was "to prevent the flow of arms and material to the communist forces." The measures did little to quell conflict in Indochina, but much to spark new antiwar protests in the United States.